Giveffect is an end-to-end software provider for non-profits. The software is available in one language as it is currently only accessible to 501 (c) 3 non-profits in America and CRA approved non-profits in Canada. It serves non-profits with an annual revenue range between $200,000 and + $300,000,000. Giveffect integrates a total of 10 systems in a single platform as it aspires to be the nonprofit solution of choice. These include offline gift and online giving monitoring system, web hosting and websites, membership management system, volunteer management and scheduling system, real-time bidding and live auctions system, fundraising and events system, major gifts and wealth screening system, constituent relationship management database, nonprofit management system and communications and marketing system. The purpose of this integration is to ensure that anything that happens on the website is entered automatically into the non-profits’ database. Also, anything to be sent out to donors and supporters is automatically sent and prepared. It is always almost impossible to know your donors and supporters when looking for donations. Giveffect allows you the chance to interact with all the visitors on your website. You also can keep track of all activities and can tell the total amount donation received. Giveffect allows non-profits access to donor information so that the next time they have a fundraiser or a Gala they can invite their supporters. The non-profits are also able to update the donors on how the donations raised helped their cause. 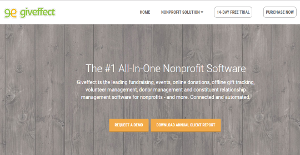 The advantages of using Giveffect as your end-to-end non-profits software system is so when all your systems are connected, data will be keyed in automatically into the database. The non-profits are also able to give donor perks to appreciate their donations. They are also able to run reports and analyze the success of their campaigns. Giveffect is also an innovative tech company. Every two weeks, they roll out new integrated features to help improve and empower your day-to-day activities. Giveffect has a friendly customer support always ready to answer all your questions. It has a 14 day free-trial period during which a non-profit can learn and understand the functionality of the software. Your subscription becomes active upon purchase. If you are interested in Giveffect it could also be beneficial to analyze other subcategories of Best Donor Management Software collected in our base of B2B software reviews. Since each organization has specific business wants, it is sensible for them to abstain from searching for a one-size-fits-all faultless software system. Needless to say, it would be pointless to try to find such a system even among popular software solutions. The smart thing to do would be to catalog the various essential factors that require consideration such as key features, budget, skill levels of staff members, company size etc. Then, you should do your research thoroughly. Read some Giveffect reviews and check out each of the other solutions in your shortlist in detail. Such in-depth homework can ensure you weed out ill-fitting systems and choose the system that provides all the aspects you need for business success. How Much Does Giveffect Cost? We realize that when you make a decision to buy Donor Management Software it’s important not only to see how experts evaluate it in their reviews, but also to find out if the real people and companies that buy it are actually satisfied with the product. That’s why we’ve created our behavior-based Customer Satisfaction Algorithm™ that gathers customer reviews, comments and Giveffect reviews across a wide range of social media sites. The data is then presented in an easy to digest form showing how many people had positive and negative experience with Giveffect. With that information at hand you should be equipped to make an informed buying decision that you won’t regret. What are Giveffect pricing details? What integrations are available for Giveffect?